It's amazing what kind of discussion can arise on Twitter when the timing, the individuals and moment is right. Awhile back a discussion rang out on Twitter about guys underwear. You know tightie whities, briefs, banana hammock etc. Everyone has their favorite but a few folks on Twitter chimed in on the comforts of myPakage Underwear. 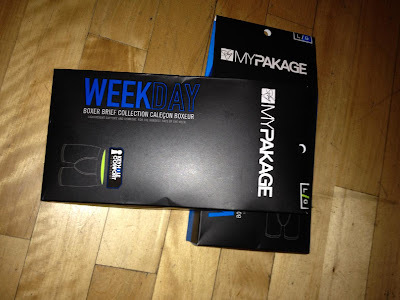 A few weeks later a pair of my Pakage Underwear from the Weekday Collection arrived on my doorstep. myPakage Underwear come in a great looking package. You really want to open the package to get inside, full marks to the marketing team on that one. the fabric is 50% more moisture absorbing than Cotton while still being incredibly breathable. PKG underwear will never shrink and stay wrinkle-free. Our patented KeyHole Comfort Technology™ creates the best and most comfortable underwear experience for men. The 3-dimensional internal pouch provides both unparalleled support and comfort. By cradling the male package, our KeyHole Comfort Technology™ allows absolute freedom and eliminates the need for any shifting and adjusting. So how do these stand up to my regular Hanes Boxer Briefs. I was a little worried that they would fit a little to tight but with the amazing comfort of the material plus myPakage's KeyHole Comfort Technology. I can honestly say these underwear are the most comfortable underwear I've ever worn. You kinda laugh when you see the pouch (KeyHole) but it really works giving you support and keeping you from that needless shifting and adjusting we as guys occasionally do. At $24.99 for the Weekday Collection and $29.99 for the Weekend Collection myPakage comes in a plethora of colors for all tastes. I highly recommend trying a pair or surprise your husband with a pair you will surely enjoy the comfort of myPakage. My life is pretty active between working as a mail carrier with Canada Post, to chasing my three young kids around to of course golf. Now in the morning when I reach for my underwear I reach for myPakage. Tried a pair of MyPakage a couple years ago and haven't been able to look back since. Definitely worth it for the support and comfort you get.